The search is on for Melksham’s Cutest Pet! DO you think you have the cutest pet in Melksham? Then this could be your chance to show off your pet in Melksham News and win a fantastic prize! Melksham News is once again looking for entries for its ‘Cutest Pet’ competition, celebrating National Pet Month. Last year’s competition was an overwhelming success with 112 Melksham pets competing for the title and hundreds of votes cast by animal-loving readers. 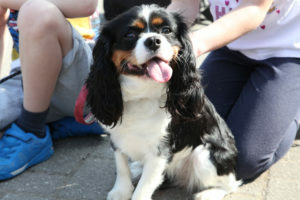 Melksham’s reigning ‘Cutest Pet’ is Cookie, a three-year-old Cavalier King Charles spaniel dog, owned by Chris and April Shuttleworth and their three sons, Oliver, Dexter and Morgan. All entries must include the name of your pet, and the owner’s name, address and contact details and must be emailed to our office by 5.00pm on Thursday 4th April. Petstown in Melksham has kindly donated a winner’s prize of Petstown gift vouchers to the winning owner. A story and photograph of the winning pet and its owner will also be featured in the following edition of Melksham News. So if you think your dog is as cute as Cookie, your cat is the one that got the cream or that your goldfish can swim its way into the hearts of our readers, send us a photo to news@melkshamnews.co.uk.